We have welcomed, and will continue to welcome, babies of all species! At Georgia Aquarium, we have new moms ranging from big to small, invertebrates to mammals. Our aquarists, animal care, and veterinary teams work tirelessly to care for our expectant mothers and their young with specialized nutrition, ultrasounds, and much more. Learn more about these unique species below! 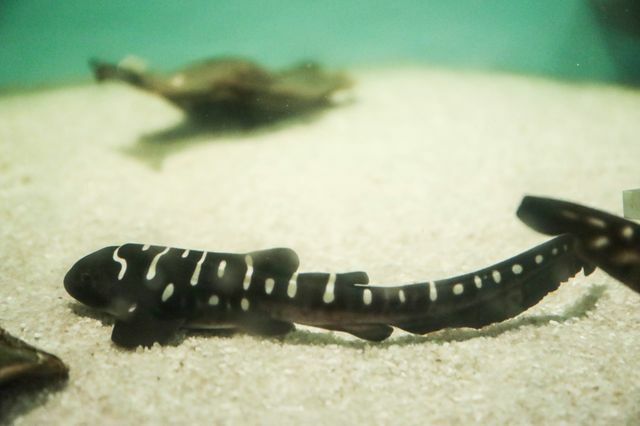 We’ve been documenting the hatching process of our zebra shark pups on our social media channels, and we hope you have been following along! So far, we’ve welcomed four pups, and are expecting more. Zebra sharks are oviparous, which means they lay eggs. 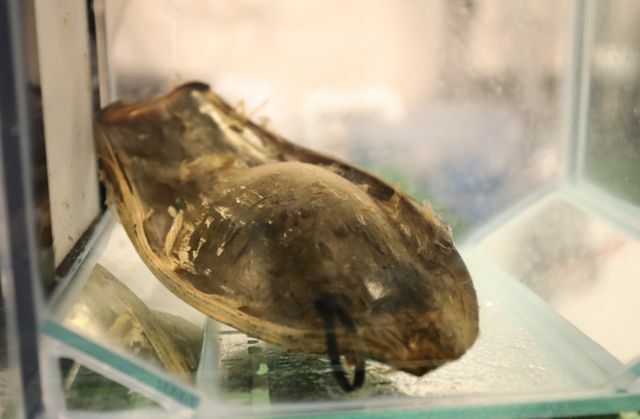 This shark species hatches from dark egg cases, sometimes referred to as mermaid purses. The zebra sharks at Georgia Aquarium are part of the Association of Zoos and Aquariums (AZA) Species Survival Plan (SSP) program. Check out our blog to learn more about this incredible species! Don’t forget to view our zebra shark pup webcam to follow along, and don’t miss the zebra sharks in our Ocean Voyager Built by The Home Depot gallery. This cephalopod species are masters of camouflage. They can change their white and black striped skin to dark purple and brown to blend into the surroundings. Female striped pajama squids store the male’s sperm packet until they are ready to lay eggs, and when they are ready, they lay round, white eggs in clumps on the sea floor. When the squid babies hatch, they already have their black stripes, which makes them easily identifiable. You can see our striped pajama squid by participating in a Behind the Seas tour. This aquari-mom is the biggest, and our animal care experts closely monitor her during her pregnancy, which can range from 14-15 months. Our teams are preparing for the upcoming birth, which for Qinu will be no simple task. 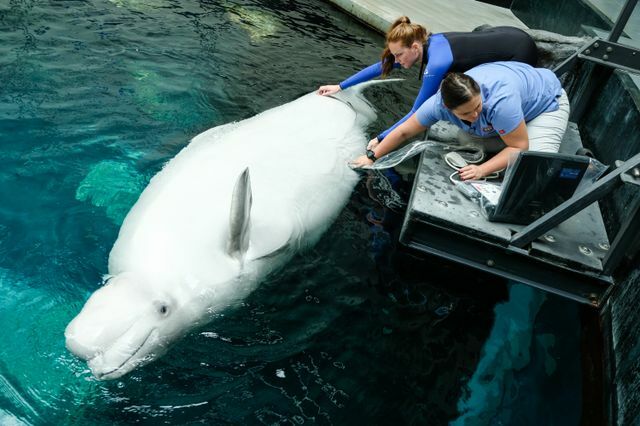 Since belugas are mammals and live in water, the calfs are born underwater and their first important milestone is to breathe using the blowhole located on the top of their head. Beluga calf’s can be around 119-145 pounds when born. 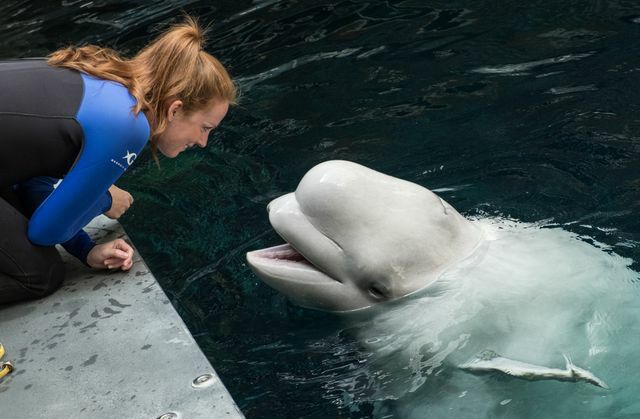 To learn more about our beluga, Qinu’s pregnancy, check out our blog, and make sure to follow along on our social media channels. You can see our beluga whales in our Cold Water Quest gallery. We’re home to many species of ray, but this species is recognizable by its dark color and abundance of white spots on its back. Spotted eagle rays are ovoviviparous, which means the embryos develop in eggs in the mother’s body before they hatch. Similar to belugas, this species has a long pregnancy, with a gestation period of approximately one year. Like the zebra sharks, our spotted eagle rays are part of the Association of Zoos and Aquariums (AZA) Species Survival Plan (SSP) program. 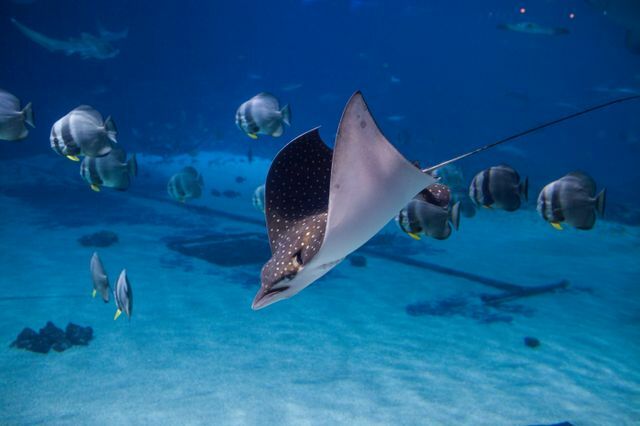 Guests can see this ray species in our Ocean Voyager Built by The Home Depot gallery. 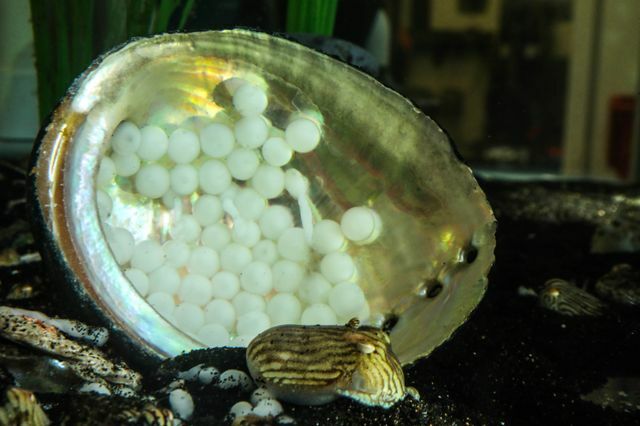 We’re expecting a wide variety of babies at Georgia Aquarium this year. The veterinary and animal care teams work together on a daily basis to ensure the very best care, and to monitor the health of animals as they grow during every phase of life. 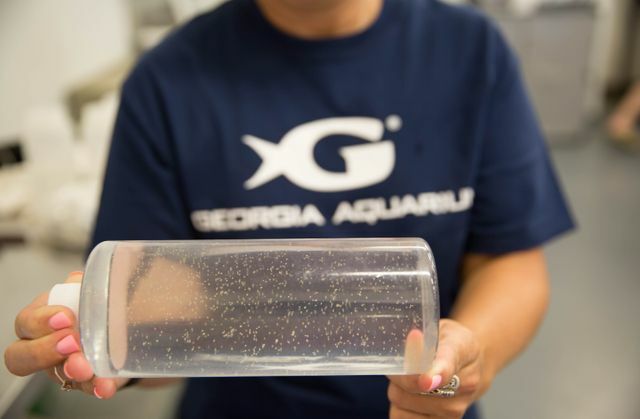 As our animal care teams prepare for multiple deliveries, stay tuned for updates along the way by following Georgia Aquarium on Facebook, Twitter, and Instagram and by visiting news.georgiaaquarium.org.